With SUPREMA you'll never blame the forecasting again! Drilling of the wells is no place for risks or inaccuracies. Foresee all the details and possibilities. 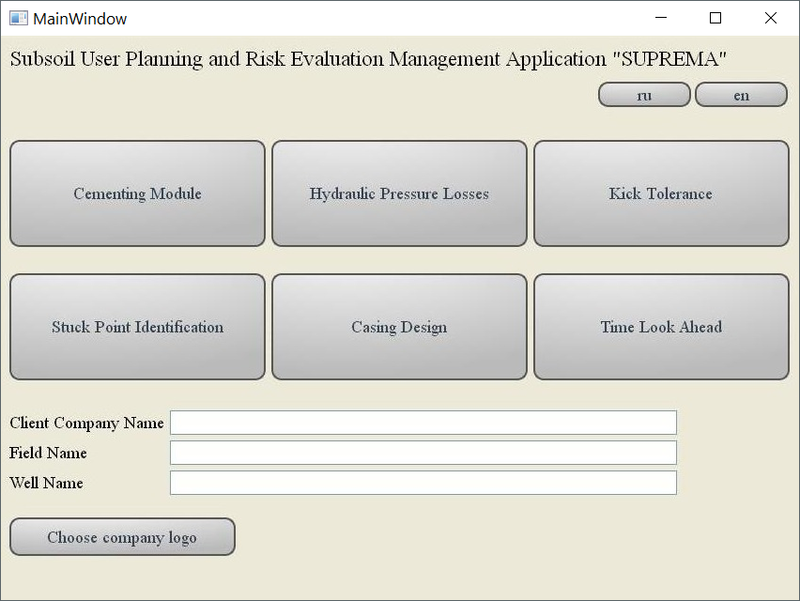 SUPREMA software helps subsoil users plan wells, reduce drilling risks and increase drilling safety. SUPREMA includes 6 modules for well planning and drilling technology. As a result of the calculations of each module, a report is generated that includes input data, results and graphs where applicable. Allows accurate calculation of fluid volumes to be pumped during cementing operation, such as spacer, cement slurry, displacement fluid. Is used to calculate pressure losses while drilling in different components of the drill string: drill pipes, drill collars, drill bit and annulus. Ratio of pressure loss at the drill bit to total pressure losses in the circulating system is important indicator for optimization of flow rate and mud pump pressure. Determination of allowable volume of inflow while drilling each hole section of the well is related to well control and is done to prevent formation fracturing below casing shoe, and safely circulate kick out of the well. Also, this indicator is used in casing design, as it dictates optimum casing seats. In case drill string is stuck in the hole, it is required to determine point of the stuck for breaking out and recovering free section of the drill string at the right place. As a result of calculations of this module, length of free section of the string is determined. Is used to develop optimum casing design, which includes selection of proper grade and weight of casing, and also allowable setting depth. Possible loads on casing are simulated in this module considering different cases, during drilling and production phases of the well. Results are compared with design factors entered by user. Proper casing design is the main factor for safe drilling and production of the well. Calculates duration of different stages of drilling the well, such as drilling, casing and cementing, geophysical studies and etc. As a result total duration of drilling is computed and Time-Depth Curve is displayed. Estimation of drilling duration helps subsoil user to plan operations, and prepare well budget, because most of the services are purchased based on day rate. SUPREMA has the ability to choose a language – Russian or English. 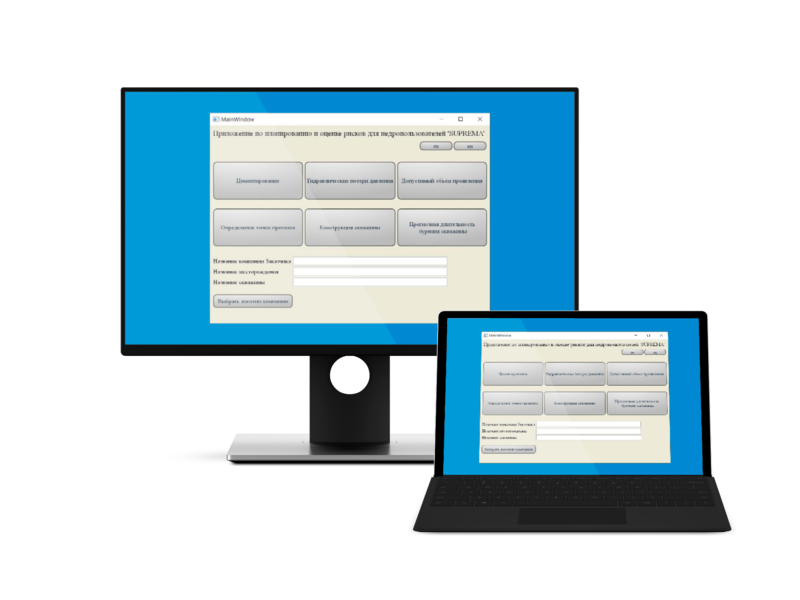 SUPREMA has protection system which prevents unauthorized usage of the software. 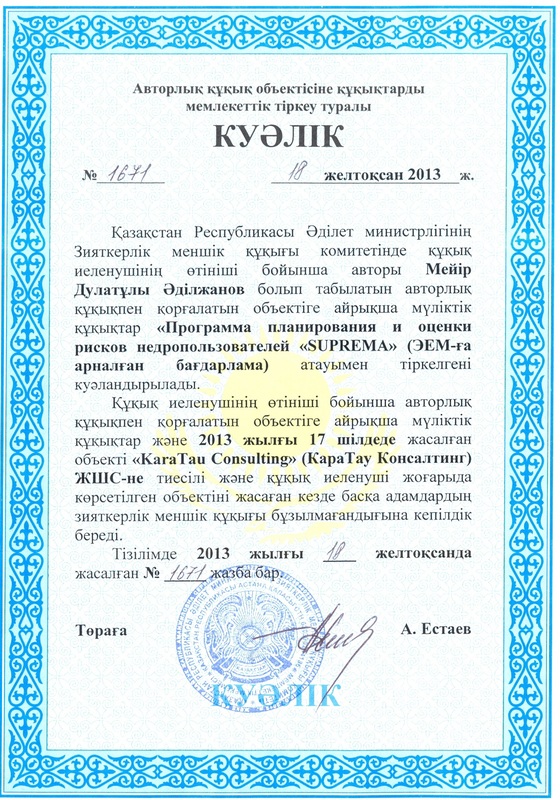 KaraTau Consulting LLP owns the copyright and intellectual property rights for exclusive engineering software “Subsoil User Planning and Risk Evaluation Management Application “SUPREMA”, created on July 17 2013. State Certificate of proprietary registration #1671, December 18, 2013. Any questions? Are you interested? Contact us and get a copy of the Program for planning and assessment of subsoil users risks “SUPREMA” at a unique price!